Turning your photos into a dazzling PhotoShow couldn't be easier. It's fast, fun, and FREE! It's so easy that just about anyone can tell an engaging, one-of-a-kind PhotoShow story in just minutes! Add pictures and videos you want included in your show. View an automatically generated slideshow and customize it until you love it. Share it instantly with your friends and family. Now the whole family can create and share their special moments in a fun, secure setting. They'll feel like they were there! Roxio PhotoShow makes it simple to combine your favorite photos and video clips from birthdays, vacations, or any other occasion with fun stickers, animations, effects, and music to create one-of-a-kind online PhotoShows they're sure to love. There's a world of difference between a plain old "slideshow" and a PhotoShow! With just a click or two, the all new PhotoShow maker lets you add your choice of hundreds of music tracks, over 150 beautiful one-click styles, plus cool animated graphics and stickers. Add one of your own MP3s to your PhotoShow and give it the soundtrack you really want. 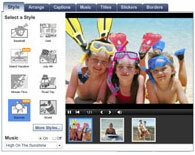 Want to share a PhotoShow of your Hawaiian vacation with friends back home...while you're still on the beach? No problem. Using the Blackberry mobile uploader, you can create and share shows directly from your phone! Share all your shows on your PhotoShow gallery page! It's the place to share the stories of your life. Organize your shows by holidays, vacations, location or each family member. Choose who can see each show, and even allow viewers to browse and download photos from your shows! Your creativity shouldn't require an Internet connection. 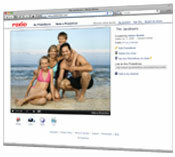 That's why your subscription to Roxio PhotoShow Service entitles you to the desktop version, too (Windows XP & Vista). Now online or offline you can create captivating PhotoShows to burn to DVD for TV playback, export as MPEG2, WMV, or save as MPEG4 for viewing on mobile devices. Need some inspiration? Check out these easy to make sample shows.